Combine all of the ingredients in the bowl of a stand mixer and mix on medium speed for one minute or until everything is combined. Pour batter into to greased and floured eight-inch cake pans. Bake at 350 degrees for 35-40 minutes or until a toothpick poked into the center of the cake comes out clean. Trim the tops of the cakes to make them flat in the center. 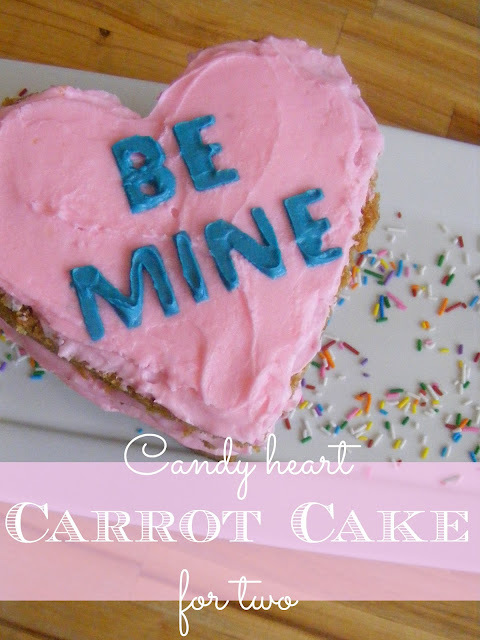 Cut a heart out of construction paper and use it as a guide to cut your cakes into heart shapes. Save the pieces you cut off and use them in place of bread in a baked french toast recipe or a bread pudding! Or just feed them to the hoards of suddenly-famished children that have eagerly and curiously collected at your feet. Slice each heart into two layers to make a total of four layers. Combine ingredients in a stand mixer and whip on high for a couple minutes until smooth. Construct cake with cream cheese icing between each layer. Place cake in the fridge for an hour so that the icing can firm up a little. Print your candy heart sentiment from your computer and cut the letters out with a craft knife. Use a sans-serif font and all capitals to mimic the look of a candy heart. Place your stencil on the cake and press down softly. Add some blue or teal food colouring to a small amount of pink icing and spread a thin layer of blue or purple icing over your stencil. Place in the fridge to share with somebody you love on Valentine's Day! Our super romantic Valentine's Day plan is to put the kids to bed, light candles, play Carcassonne, and eat cake. What are you doing for Valentine's Day? I love the idea of using a stencil for the frosted words. This is adorable! Thank you so much for sharing! Love it and your instructions : especially the bit about sharing the off-cuts with the hoard of children that seem to mysteriously congregate in the vicinity of cake baking. I had this issue many moons ago. I'd have to bake multiple batches of things because the first batch would mysteriously disappear from the cooling rack before the next batch was ready. Cupcakes invariably never were iced! Here's to a wonderful Valentine's Day for you and your beloved. So cute and simple! I love it! Oh dear. I hate valentines day, it's a dreadful invention. Wow, it is a nice cake. I should have to visit your blog before the Valentine’s Day. I missed it. Oh yum. It is too late to do for Vday, but I will def. be making that cake sometime! It is a mouth watering cake recipe. I am looking forward to try this cake for my son’s birthday. Also I can show how much I care for him by adding a heart touching quote.